Our story last week (BTN Cruise News – Monaco Grand Prix) seems to have aroused great interest from readers who would like to pretend to be a billionaire for the day, sail into the Principality on one of the world's largest sailing ships, and in real style watch what is arguably the outstanding motor race of the season. All for what is really a relatively modest amount (inclusive prices for a 10-night holiday start at £2,559). Star Clipper has now issued a list of answers to some of the questions raised about their wonderful three-ship fleet. How much do the sails weigh? Surprisingly, the thousands of square feet of billowing sails weigh relatively little, thanks to the modern Dacron fabric from which they are made. 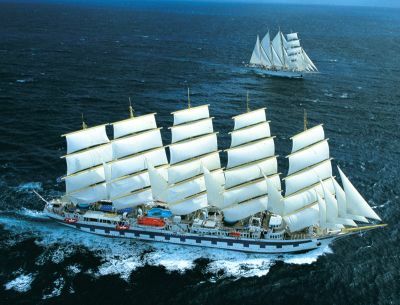 On Star Clipper and Star Flyer, the sails weigh about two tons, while on the larger Royal Clipper, it is double this. How much time do the ships actually spend sailing? In the Caribbean, where the wind is most predictable, the ships operate under wind power up to 70%, thus minimising use of the auxiliary engines, which also power the air-conditioning and provide electricity for the day-to-day operation of the ship. What kind of fuel do they burn? When Star Clippers ships do consume fuel, it is a less-polluting grade. All three vessels only use very pure, high-quality low-sulphur gas oil; for this the company was awarded the International Air Pollution Prevention Certificate. Star Flyer was the first ship in the world to receive this certificate, followed later by Star Clipper and Royal Clipper. How much varnish does it take to keep the wood looking shiny? Star Clippers gets through a lot of varnish in a year; approximately two tons for the smaller ships, Star Clipper and Star Flyer, and about three tons for Royal Clipper. Varnish is not just about appearance; the wood has to be protected from the elements. How do you keep the undersides of the ships clean? The ships go into dry dock every two to five years where one of the jobs is to clear the underside of barnacles. Sometimes this job is done when the ship is still in the water, using an eco-friendly anti-fouling agent. Barnacles may seem small when you see them along the shoreline – but living on a ship, they can grow as big as tennis balls. How far can the ships actually heel? Royal Clipper’s five-masted, fully square-rigged design is such that she does not heel at much of an angle but Star Flyer and Star Clipper are able to lean over safely much further, just as the original racing clippers of the 19th century did. The maximum heel preferred when there are passengers on board is ten degrees but both ships have been put through their paces and achieved a much more exciting angle. Both have raced in the Classic Regatta in Antigua, for which the decks were cleared of furniture and the guests on board given special race training. What is the music that echoes across the decks every time a ship leaves port? It is a Star Clippers tradition to play 1492 – Conquest of Paradise by Vangelis (something which has been copied by many other cruise lines). The crew have heard this music literally thousands of times but guests love it and hearing it always evokes memories for them of departing under sail from some of the world’s most beautiful ports. What happened to the parrots? Star Clippers was once known for the colourful parrots it kept in the Tropical Bar on each ship. Each parrot was tended by a particular crewmember and the birds were very happy – they became the darlings of the whole ship. Usually they were ‘Amazona’ parrots and loved talking. Sadly, the company had to stop this tradition as certain animal rights people in the US objected to their presence on board the ship. Why don’t Star Flyer and Star Clipper have figureheads? Who is the mystery lady on Royal Clipper’s bowsprit? The figurehead on Royal Clipper is Marie Krafft, Mikael Krafft’s daughter and today Director of Sales for the company. It has been in place for 12 years and is made of Douglas Fir. Mikael Krafft explains: “Marie had to go to the craftsmen’s workshop so that Claus and Birgit Hartmann could take a moulding of her face. They make their living creating sculptures and figureheads for ships. It was a very proud moment when these two artists gave the Marie figurehead to the Royal Clipper in Rotterdam". Business Travel News has a final question which we will answer ourselves. Are the guests allowed to climb the masts? The answer is yes, under strict supervision. A harness is provided.